Take notes like a BOSS! 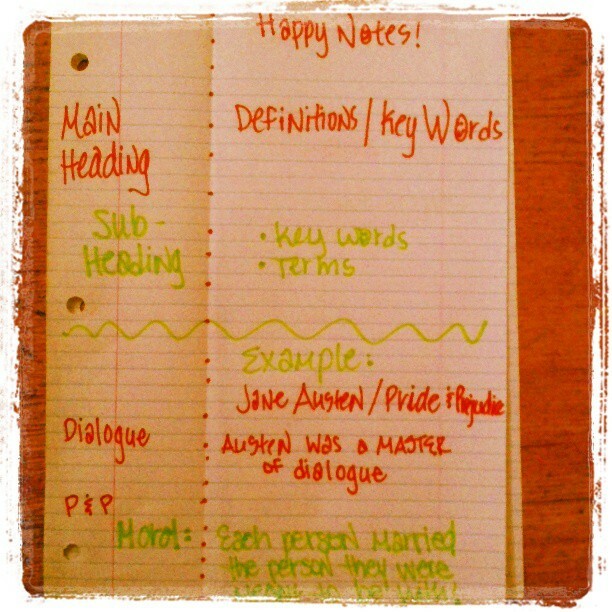 So, I’m going to share with you the note-taking method I learned in high school. Now, these notes have a name, but I don’t remember it! Fold the side with the holes back, that way you show all your headings and can quiz yourself on the terms and definitions! Lately I’ve been running around like a crazy person. I guess sometimes that happens. You know, when you feel like you’re balancing 100 things at once and there’s not quite enough time in the day. Or when you on your way to an appointment in rush-hour traffic and there’s nothing you can do about it. Yep, those kind of things definitely happen. And boy am I thankful for the people who understand that sometimes things are just out of your control. And I’m very happy to announce that we’re adding some new ‘thing-balancers’, helpers, hard-workers, and all around great new tutors! Kim Sanchez (whose bio you can find on the “Spanish” tab) is observing some sessions this week and will be joining to help out with our Spanish clients soon! Mai Silvius (her bio is under the “German” tab) is willing and ready to take on some new German students. And Jingya Zhang (our Mandarin tutor) is now available through Skype. And for those of you who were wondering, we’re all available through Skype for online sessions so we can help you no matter where you are! In addition to our great new tutors we are also adding Note-taking, Study-Skills, and Time-Management Classes to help all you “100-things-at-once” balancers out there! You never know, but sometimes it helps to just sit down and get an outside perspective! I know sometimes we all feel like were running at 80 mph with an empty tank, but there are people out there who love, support and understand you. And sometimes all we need is a little acknowledgement and a ‘thank you.’ So, I want to say, ‘thank you’ to all of you out there. Thanks for your support and business. And all you blog followers, thanks for reading the musings of this native SC girl, living and working in the big-city, growing her business one step at a time! I wanted to share with you the thanks and appreciation I’ve received in the past couple weeks and I want to thank those people in return. 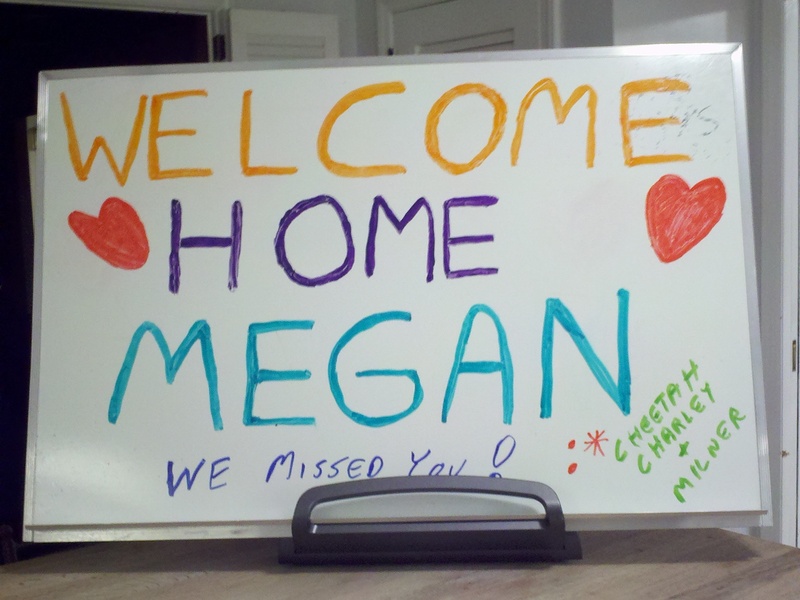 First of all, thank you to my wonderful fiancé for my “Welcome Home” sign after my trip up North and back. And thank you from the bottom of my heart to a former student who took time out of his busy day to write to me. That meant more than you know! ¡Gracias a todos y que tengan una buena semana!